Features - Revenge of the Zombies, Frankenstein 1970, Bela Lugosi as Ygor, Roger Corman's Undead, The Haunting for Sega Genesis, Death of EC Comics. Amazing art with Maroto, Nino, Heath, Gonzalez, Neary and Torrents. VFN condition. RARE HORROR MAGAZINE 2 FREE CLASSIC HORROR PHOTOS. 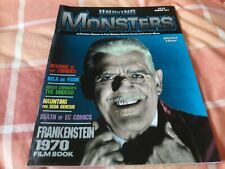 1960'S MONSTER MAGAZINE FROM WARREN PUBLISHING. LATEST ISSUS OF THIS RARE HORROR MAGAZINE 3 FREE CLASSIC HORROR PHOTOS. THE HORROR OF PARTY BEACH (PHOTO MAGAZINE) / V.GOOD / WARREN 1964 / RARE. THE HORROR OF PARTY BEACH (PHOTO MAGAZINE ,PUBLISHED BY WARREN 1964. THIS 35 CENTS MAGAZINE IS IN V.GOOD CONDITION,THERE IS A PRICE STAMP & 1/6d IN BLACK MARKER ON THE FRONT COVER,HEAVY COVER & SPINE WEAR & CREASING INCLUDING TAPE TO THE LENGTH OF THE SPINE,AND AGE TANNING TO THE COVERS & INTERNAL PAGES. ).